I purchased this as a gift for my mother, and I am certain she is going to love it. It actually showed this was on backorder, so was pleasantly surprised to receive it so quickly. Its shine and shimmer rivals that of flawless diamonds...leaps and bounds more than a cz. I have purchased everything from watches to jewelry from Stauer, and I can tell you the quality of their items is hard to beat- this one is no exception. It is both elegant and beautiful. As a side note, if you are looking for a cheaper alternative to a diamond with just as much sparkle, I highly recommend anything with their Diamond Aura. You or the person you are giving it to will almost certainly be awestruck upon opening the box. 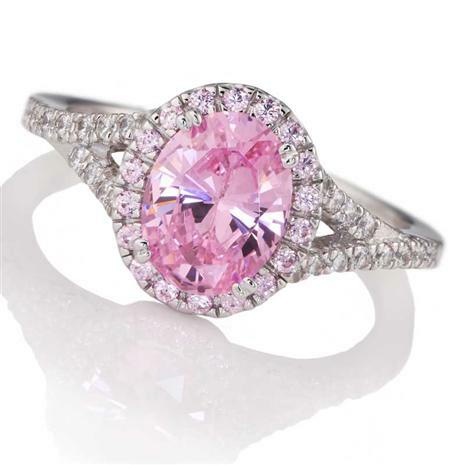 I ordered this ring recently, it is absoultley beautiful, just like the picture.It stands out so much, I feel like it looks even better then my wedding rings, which is a pink Sapphire I will order more items I'm so glad i decided to order this particular piece.